(Nanowerk News) Sandwiched among the many lengthy technical titles for experiments conducted at SLAC's Linac Coherent Light Source X-ray laser, one stood out for its two-word simplicity, spelled out in all caps: "GIANT VIRUSES." From July 19 to 23, scientists lined up samples of some of the largest known viruses on the planet for an extensive X-ray "photo shoot" that may produce the highest-resolution 3-D images yet of these mysterious specimens – and bring researchers closer to understanding their functions and origins. The experiments marked the first visit of Megavirus to LCLS, and a return visit for a slightly smaller giant virus, called Mimivirus, which had been studied in previous sets of LCLS experiments. These massive viruses, which are large enough to be observed by standard light microscopes, were miscategorized as bacteria until about a decade ago because of their size and complex genetics. The experiments at LCLS may help scientists unravel the origins and evolution of Earth's earliest microscopic inhabitants. 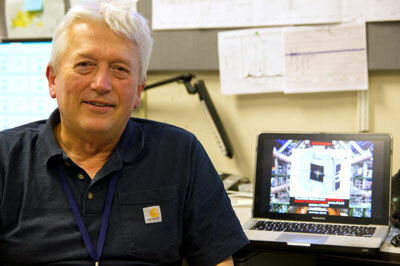 Janos Hajdu, visiting professor of photon science at Stanford University and professor of molecular biophysics at Uppsala University in Sweden, has participated in several rounds of experiments at SLAC's Linac Coherent Light Source studying giant viruses, including samples of Megavirus and Mimivirus. Since the first identification in 2003 of a giant virus – named Mimivirus because it has qualities that mimic those of bacteria – scientists have broadened their search for other massive viruses, classifying several more that fit this newly minted mold. It remains unclear whether viruses played a parasitic sideshow or shared the main stage in the formative phases of planetary life and cellular development. Giant viruses such as Mimivirus and Megavirus do fit the strict definition of viruses: microorganisms that cannot grow or reproduce apart from a living cell. But their size, genetic complexity and other unconventional viral characteristics raise questions about whether they should be considered living or nonliving. Researchers have even found evidence that giant viruses can be infected by smaller viruses. Mimivirus and Megavirus, which target small organisms such as amoeba, are larger than some bacteria, and each contain more than 1,000 genes. While that’s a far cry from the estimated 20,000 to 25,000 genes in the human genome, it is hundreds more than are found in many forms of bacteria. "It looks like they may have a similar type of genome to our chromosomes," said Janos Hajdu, a key investigator in the giant virus experiments at LCLS. He is a visiting professor of photon science at Stanford University and a professor of molecular biophysics at Uppsala University in Sweden. Scientists have offered up theories "that these giant viruses have a link or common origin" to cellular nuclei, Hajdu said, so it is important to understand their chemical makeup and structure. These viruses measure hundreds of nanometers, or millionths of a millimeter, in diameter and are tens of times larger than their previously known relatives. A key part of the latest LCLS experiments was to observe the viruses using specific X-ray energies that allow selective imaging of nucleic acid, the essential chemical component of DNA and other genetic material, and its surroundings within the virus, Hajdu noted. "If these viruses contain chromatin-type nucleic acids," which cram DNA into cell nuclei, "that is something that supports the notion that there is a link" between viruses and cells, Hajdu said. Such definitive evidence, he said, "will change molecular biology." As Hajdu spoke, a stream of X-ray images from single virus particles captured by intense X-ray pulses from the LCLS, flashed on a screen behind him. His team of collaborators gathered data from millions of such images, which they will now sort through in analyzing and reconstructing the viruses. The virus samples, not harmful to humans, were readied in a portable lab building near LCLS that had been shipped from Sweden. Researchers had conducted preparatory experiments at FLASH, a lower-energy X-ray free-electron laser at DESY in Hamburg, Germany. "We can do a lot of the footwork that is necessary there, and then perform the really important high-resolution experiments here at LCLS," Hajdu said. Past experiments at LCLS had focused on two-dimensional imaging of Mimivirus. "We'd like to extend that to 3-D at high resolution,” he said. He noted that while the science of FELs has improved, higher-intensity X-ray lasers are needed to achieve higher-resolution imaging. "An ultimate aim is to have the structure of a living cell at or near atomic resolution. This may perhaps be possible. At that point, we would be able to see everything and where it worked naturally," Hajdu said. "If you want to study the whole, you have to look at the whole." If and when the structures of cellular components are ever resolved with an X-ray laser, the next challenge would be to differentiate the functions performed by similar structures. In addition to Uppsala University and SLAC, collaborators were from the Genomic and Structural Information Laboratory in France, which provided the virus samples; Stanford University; Lawrence Berkeley National Laboratory; the Institute for Solid State Physics and Optics in Hungary; the Center for Free Electron Laser Science in Germany; and the European XFEL.